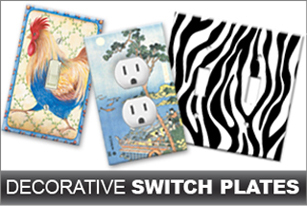 SwitchPlates' collection is unmatched, giving homeowners countless design options to adorn their walls with. Select from designs fashioned after the artwork of famous painters like Van Gogh, Monet, Da Vinci and Picasso, as well as plates with assorted themes such as nature, floral, holiday, whimsical, tropical, oriental, spiritual, music and many more. There is always something for every room in your house, and finding the best fit for your space is never a problem. All switch plates are standard size (single gang = 4.5 x 2.75 / double gang = 4.5 x 4.57 / triple gang = 4.5 x 6.375) unless you order oversize plates from our custom order page. A variety of colors and finishes are available to blend with the mood your room represents. Aside from the usual primary colors and earth tones, SwitchPlates also boasts of numerous eye-catching varieties that homeowners won't find elsewhere. All switch plates and electrical outlet covers are created using a very special high resolution printer that prints directly on our heavy duty metal switch plates. There simply are no other decorated switch plates on the planet that can compare to the richness of color and resolution that we can achieve. Every wall plate and outlet has a final UV cured high gloss finish. This creates an extremely durable shiny finish that also helps protect it from abrasions and scratches. With this kind of technique, you can be sure that your switch plates and covers are both gorgeous and sturdy. Wall plates and outlet covers come in different shapes and sizes, and Switch Plates understands this. We offer many non-conventional wall plate covers that have become a favorite option among many customers. May it be a combination 2 gang wall plate or a 3 gang combination switch plate, SwitchPlates will work on the cover that you need to finish your remodeling project. Such cute items can never go wrong as gifts for family and friends. Switch Plates places your gifts in gorgeous see-through packaging for an instant sneak peek. Best of all, shipping for retail orders is absolutely FREE within the US! Call now at 888-343-2350 and 909-980-7960 to know more about SwitchPlates' products, or email us for queries. Copyright © Switch Plates.com, . All rights reserved.